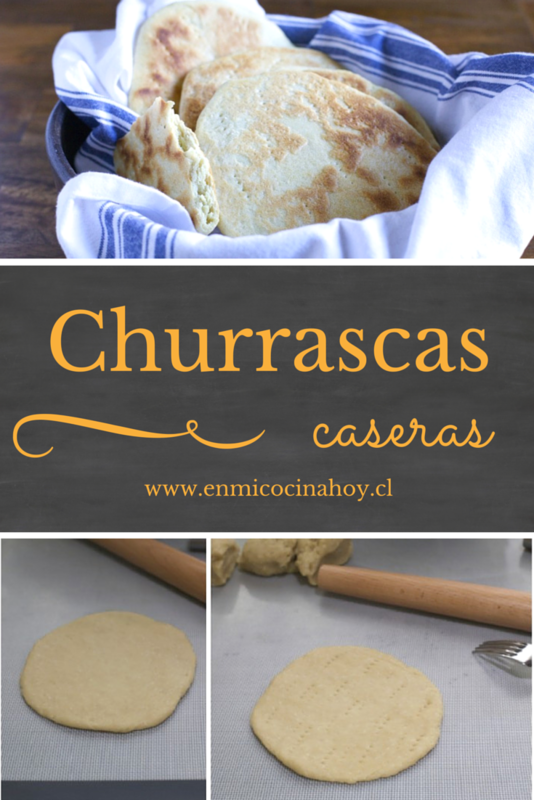 A traditional Chilean stovetop bread, inexpensive, simple to prepare and delicious. The perfect solution for the days when I can not buy bread or just want to remember old times. It is the same recipe used in Chile for the “Tortilla de rescoldo”, a bread cook on ashes, this version uses vegetable oil instead of lard, lard would be more traditional. These quick bread become hard when cold, and should be eaten immediately. With this recipe, I participated in the monthly challenge at BRBC, where we’re cooking bread and Chilean sandwiches. In a bowl mix the flour, baking powder, baking soda and salt, stir well with a fork. In a bowl or jug mix the warm water with the oil. Pour the oil mixture over the flour. Stir with a wooden spoon. Form a soft dough and knead for 10 minutes by hand or 5 minutes with the mixer (I use a KitchenAid). Cut the dough into 6 equal portions, then form rolls and using a rolling pin, roll the dough until 13-15 cm in diameter and 0.5 cm thick. Cook in a hot skillet over medium-low heat for 5 minutes, then flip and cook the other side for 5 minutes. Tengo unas preguntad, se puede hacer de antemano y como se pueden mantener calientes? No recomiendo hacerlas con anticipación, se ponen duras, las puedes mantener tibias en el horno a 100C o 200F. Suerte.